Terminal part of the forearm with a tactile and prehensile function and a thumb opposable to the other fingers. The skeleton of the hand has 27 bones. Last phalange of the finger bearing a nail. First phalange of the finger; it is connected to the metacarpus. Second phalange of the finger between the proximal and distal phalanges. The thumb does not have a middle phalange. Bone of the anterior row of the carpus, articulating especially with the metacarpal bones of the third and little fingers. Last bone in the posterior row of the carpus, set opposite the thumb. Bone of the posterior row of the carpus; it is the smallest of the carpal bones. Bone of the anterior row of the carpus articulating especially with the metacarpal bone of the index finger. Bone of the anterior row of the carpus articulating especially with the metacarpal bone of the middle finger. The largest bone in the posterior row of the carpus articulating with the radius to form the wrist. Long bone forming the inner portion of the forearm, and articulating especially with the radius. All eight short articulated bones, laid out in two rows, forming the wrist and giving it a wide range of motion; it connects the radius to the metacarpus. 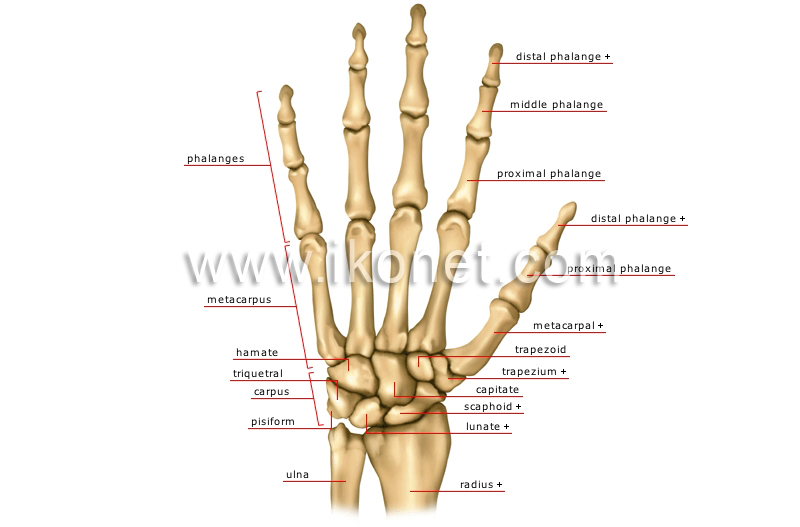 All five long bones forming the palm of the hand; they link the anterior row of the carpus to the proximal phalanges. Articulated bones forming the skeleton of the fingers; each finger has three, while the thumb has two.